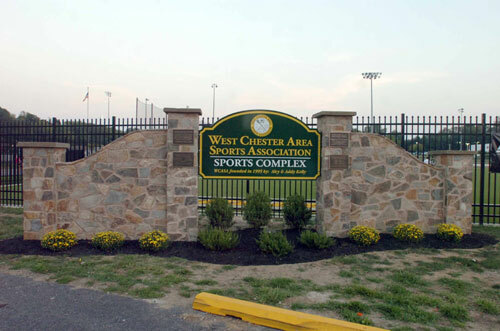 A new sign was recently installed at the entrance of the West Chester Area Sports Association Complex. The sign was designed by Gary Bevilacqua and Blaise Santangelo and was paid for by the West Chester United Soccer Club, East Side Little League, West Chester Lacrosse League, Little All-American Football Association and the Wildfire Girls Sofball League. Local business and individuals donated time and materials to help defray the cost of this beautiful sign. Knox Rental, Blaise Santangelo Design & Landscaping, Pinnacle Stone, Kevin McDevitt and Jerry Riccardo all donated time or materials to the construction of the new sign. 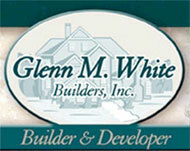 We are extremely appreciative of their generosity and time. Bliase Santangelo Design & Landscaping, Mainline Concrete, Fizzano Block, Austin Graphics, Colonial Metal Polishers and Wescho Company, Inc. provided low cost materials in the sign construction. Once again, our local businesses stepped up to help make our Complex the most beautiful Sports Complex in Chester County.